Area: 98,477 sq. km. (38,022 sq. mi. ); about the size of Indiana. 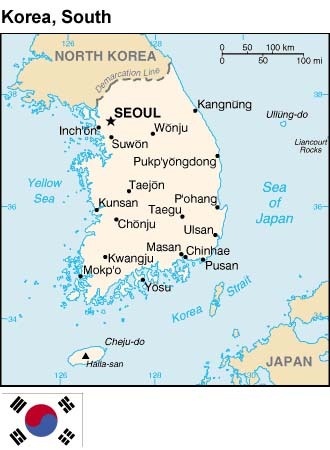 Cities (2005): Capital--Seoul (10.3 million). Other major cities--Busan (3.7 million), Daegu (2.5 million), Inchon (2.6 million), Gwangju (1.4 million), Daejeon (1.5 million), Ulsan (1.0 million). Education: Years compulsory--9. Enrollment--11.5 million. Attendance--middle school 99%, high school 95%. Literacy--98%. Health (2006): Infant mortality rate--6.16/1,000. Life expectancy--77.0 yrs (men 73.6 yrs. ; women 80.8 yrs). Work force (2005): 23.53 million. Services--67.2%; mining and manufacturing--26.4%; agriculture--6.4%. Branches: Executive--President (chief of state); Prime Minister (head of government). Legislative--unicameral National Assembly. Judicial--Supreme Court and appellate courts; Constitutional Court. Political parties: Uri Party (Uri); Grand National Party (GNP); Democratic Party (DP); United Liberal Democrats (ULD); Democratic Labor Party (DLP); People Centered Party (PCP). Central government budget (2004): Expenditures--$100.46 billion. Defense (2005): $21.06 billion; over 680,000 troops. Nominal GDP (2005 est. ): $811.1 billion. GDP growth rate: 2003, 3.1%; 2004, 4.6%; 2005, 4.0%. Per capita GNI (2004): $14,162. Consumer price index: 2003, 3.6%; 2004, 3.6%; 2005, 2.8%. Agriculture, including forestry and fisheries: Products--rice, vegetables, fruit, root crops, barley; cattle, pigs, chickens, milk, eggs, fish. Arable land--17% of land area. Industry: Types--Electronics and electrical products, motor vehicles, shipbuilding, mining and manufacturing, petrochemicals, industrial machinery, textiles, footwear. Trade (2005 est. ): Exports--$ 284.6 billion f.o.b. : electronic products (semiconductors, cellular phones, computers), automobiles, machinery and equipment, steel, ships, textiles. Major markets--China (including Hong Kong) (19.6%), U.S. (16.9%), European Union (12.8%), Japan (8.5%). Imports--$261.1 billion f.o.b. : crude oil, food, machinery and transportation equipment, chemicals and chemical products, base metals and articles. Major suppliers--Japan (20.6%), China (13.1%), U.S. (12.8%), European Union (10.8%), Saudi Arabia (6.4%). Korea�s population is one of the most ethnically and linguistically homogenous in the world. Except for a small Chinese community (about 20,000), virtually all Koreans share a common cultural and linguistic heritage. With 48.42 million people, South Korea has one of the world�s highest population densities. Major population centers are located in the northwest, southeast, and in the plains south of Seoul-Incheon. Half of the population actively practices religion. Among this group, Christianity (49%) and Buddhism (47%) comprise Korea�s two dominant religions. Though only 3% identified themselves as Confucianists, Korean society remains highly imbued with Confucian values and beliefs. The remaining 1% of the population practice Shamanism (traditional spirit worship) and Chondogyo ("Heavenly Way"), a traditional religion. The myth of Korea�s foundation by the god-king Tangun in BC 2333 embodies the homogeneity and self-sufficiency valued by the Korean people. Korea experienced many invasions by its larger neighbors in its 2,000 years of recorded history. The country repelled numerous foreign invasions despite domestic strife, in part due to its protected status in the Sino-centric regional political model during Korea�s Chosun dynasty (1392-1910). Historical antipathies to foreign influence earned Korea the title of "Hermit Kingdom" in the 19th century. With declining Chinese power and a weakened domestic posture at the end of the 19th century, Korea was open to Western and Japanese encroachment. In 1910, Japan began a 35-year period of colonial rule over Korea. As a result of Japan�s efforts to supplant the Korean language and culture, memories of Japanese annexation still recall fierce animosity and resentment, especially among older Koreans. Nevertheless, import restrictions on Japanese movies, popular music, fashion, and the like have been lifted, and many Koreans, especially the younger generations, eagerly follow Japanese pop culture. Aspects of Korean culture, including television shows and movies, have also become popular in Japan. Japan�s surrender to the Allied Powers in 1945, signaling the end of World War II, only further embroiled Korea in foreign rivalries. Division at the 38th Parallel marked the beginning of Soviet and U.S. trusteeship over the North and South, respectively. On August 15, 1948 the Republic of Korea (R.O.K.) was established, with Syngman Rhee as the first President. On September 9, 1948 the Democratic People�s Republic of Korea (D.P.R.K.) was established under Kim Il Sung. On June 25, 1950, North Korean forces invaded South Korea. Led by the U.S., a 16-member coalition undertook the first collective action under United Nations Command (UNC). Following China�s entry on behalf of North Korea later that year, a stalemate ensued for the final two years of the conflict. Armistice negotiations, initiated in July 1951, were ultimately concluded on July 27, 1953 at Panmunjom, in the now Demilitarized Zone (DMZ). The Armistice Agreement was signed by representatives of the Korean People�s Army, the Chinese People�s Volunteers, and the U.S.-led United Nations Command (UNC). Though the R.O.K. supported the UNC, it refused to sign the Armistice Agreement. A peace treaty has never been signed. The war left almost three million Koreans dead or wounded and millions of others homeless and separated from their families. In the following decades, South Korea experienced political turmoil under autocratic leadership. President Syngman Rhee was forced to resign in April 1960 following a student-led uprising. The Second Republic under the leadership of Chang Myon ended after only one year, when Major General Park Chung-hee led a military coup. Park�s rule, which resulted in tremendous economic growth and development but increasingly restricted political freedoms, ended with his assassination in 1979. Subsequently, a powerful group of military officers, led by Lieutenant General Chun Doo Hwan, declared martial law and took power. Throughout the Park and Chun eras, South Korea developed a vocal civil society that led to strong protests against authoritarian rule. Composed primarily of students and labor union activists, protest movements reached a climax after Chun�s 1979 coup and declaration of martial law. A confrontation in Gwangju in 1980 left at least 200 civilians dead. Thereafter, pro-democracy activities intensified even more, ultimately forcing political concessions by the government in 1987, including the restoration of direct presidential elections. In 1987, Roh Tae-woo, a former general, was elected president, but additional democratic advances during his tenure resulted in the 1992 election of a long-time pro-democracy activist, Kim Young-sam. Kim became Korea�s first civilian elected president in 32 years. The 1997 presidential election and peaceful transition of power marked another step forward in Korea�s democratization when Kim Dae-jung, a life-long democracy and human rights activist, was elected from a major opposition party. The transition to an open, democratic system was further consolidated in 2002, when self-educated human rights lawyer, Roh Moo-hyun, won the presidential election on a "participatory government" platform. The Republic of Korea (commonly known as "South Korea") is a republic with powers nominally shared among the presidency, the legislature, and the judiciary, but traditionally dominated by the president. The president is chief of state and is elected for a single term of 5 years. The 299 members of the unicameral National Assembly are elected to 4-year terms--243 members are from single-seat districts and 56 members are chosen by proportional representation. South Korea�s judicial system comprises a Supreme Court, appellate courts, and a Constitutional Court. The judiciary is independent under the constitution. The country has nine provinces and seven administratively separate cities--the capital of Seoul, along with Busan, Daegu, Daejeon, Gwangju, Incheon and Ulsan. Political parties include the Uri Party (Uri), Grand National Party (GNP), Democratic Labor Party (DLP), Democratic Party (DP), and People Centered Party (PCP). Suffrage is universal at age 19 (lowered from 20 in 2005). In December 2002, President Roh Moo-hyun was elected to a single 5-year term of office. In the April 2004 elections, the ruling Uri Party won a slim, but outright majority in the National Assembly. Because of the loss of seats in by-elections and as a result of convictions for election law violations, Uri no longer has a majority, but does retain a plurality of seats. Korea maintains an embassy in the United States at 2450 Massachusetts Avenue NW, Washington, DC 20008 (tel. 202-939-5600). Consulates general are located in Atlanta, Boston, Chicago, Honolulu, Houston, Los Angeles, New York, San Francisco, Seattle, and Hagatna (Agana) in Guam. The Republic of Korea�s economic growth over the past 30 years has been spectacular. Per capita GNP, only $100 in 1963, exceeded $14,000 in 2004. South Korea is now the United States� seventh-largest trading partner and is the 11th-largest economy in the world. In recent years, Korea�s economy moved away from the centrally planned, government-directed investment model toward a more market-oriented one. Korea bounced back from the 1997-98 Asian financial crisis with some International Monetary Fund (IMF) assistance, but based largely on extensive financial reforms that restored stability to markets. These economic reforms, pushed by President Kim Dae-jung, helped Korea maintain one of Asia�s few expanding economies, with growth rates of 10% in 1999 and 9% in 2000. The slowing global economy and falling exports slowed growth to 3.3% in 2001, prompting consumer stimulus measures that led to 7.0% growth in 2002. Consumer over-shopping and rising household debt, along with external factors, slowed growth to near 3% again in 2003. Economic performance in 2004 improved to 4.6%, due to an increase in exports. Economists are concerned that South Korea�s economic growth potential has fallen because of a rapidly aging population and structural problems that are becoming increasingly apparent. Foremost among these structural concerns is the rigidity of South Korea�s labor regulations, the need for more constructive relations between management and workers, the country�s underdeveloped financial markets, and a general lack of regulatory transparency. Restructuring of Korean conglomerates ("chaebols") and creating a more liberalized economy with a mechanism for bankrupt firms to exit the market are also important unfinished reform tasks. Korean policy makers are increasingly worried about diversion of corporate investment to China and other lower wage countries. Tourism: R.O.K.-organized tours to Mt. Kumgang in North Korea began with cruise boat tours in 1998. Overland tours to Mt. Kumgang began in 2003, five years after the cruise tours started. Infrastructure Development: East and west coast railroad and roads links have been reconnected across the DMZ and work continues to improve these transportation routes. Much of the work done in North Korea has been funded by the R.O.K. On the west coast, the rail line and road are both complete as far north as the Kaesong Industrial Complex (six miles north of the DMZ), but little work is being done on the rail line north of Kaesong. On the east coast, the road is complete but the rail line is far from operational. As of August 2006, neither railroad link had been tested. Kaesong Industrial Complex (KIC): Following a June 2003 groundbreaking, the KIC entered its pilot phase when 15 R.O.K. companies began constructing manufacturing facilities there. With about 35 companies having begun operations at the KIC as of August 2006, the R.O.K. envisages a substantial enlargement of participation in the project in the following years. Two-way trade between North and South Korea, legalized in 1988, hit almost $1.1 billion in 2005. This total included a substantial quantity of non-trade goods provided to the North as aid (food, fertilizer, etc.) or as part of inter-Korean cooperative projects. According to R.O.K. figures, about 60% of the total trade consisted of commercial transactions, much of that based on processing-on-commission arrangements. The R.O.K. is North Korea�s second-largest trading partner. For almost 20 years after the 1950-53 Korean War, relations between North and South Korea were minimal and very strained. Official contact did not occur until 1971, beginning with Red Cross contacts and family reunification projects in 1985. In the early 1990s, relations between the two countries improved with the 1991 South-North Basic Agreement, which acknowledged that reunification was the goal of both governments, and the 1992 Joint Declaration of Denuclearization. However, divergent positions on the process of reunification and North Korean weapons programs, compounded by South Korea�s tumultuous domestic politics and the 1994 death of North Korean leader Kim Il-sung, contributed to a cycle of warming and cooling of relations. Relations improved again following the 1997 election of Kim Dae-jung. His "Sunshine Policy" of engagement with the D.P.R.K. set the stage for the historic June 2000 inter-Korean summit between President Kim and North Korean leader Kim Jong Il. President Kim was awarded the Nobel Peace Prize in 2000 for the policy, but the prize was somewhat tarnished by revelations of a $500 million dollar "payoff" to North Korea that immediately preceded the summit. Relations again became tense following the October 2002 North Korean acknowledgement of a covert program to enrich uranium for nuclear weapons. Following this acknowledgement, the United States, along with the People�s Republic of China, proposed multilateral talks among the concerned parties to deal with this issue. At the urging of China and its neighbors, the D.P.R.K. agreed to meet with China and the United States in April 2003. In August of that year, the D.P.R.K. agreed to attend Six-Party Talks aimed at ending the North�s pursuit of nuclear weapons that added the Republic of Korea, Japan, and Russia to the table. Two more rounds of Six-Party Talks between the United States, the Republic of Korea, Japan, China, and the D.P.R.K. were held in February and June of 2004. At the third round, the U.S. put forward a comprehensive proposal aimed at completely, verifiably, and irreversibly eliminating North Korea�s nuclear weapons programs. A fourth round of talks was held in July 2005 and spanned a period of 20 days between July and September. All parties agreed to a Joint Statement of Principles on September 19, in which, among other things, the six parties unanimously reaffirmed the goal of verifiable denuclearization of the Korean Peninsula in a peaceful manner. In the Joint Statement, the D.P.R.K. committed to "abandoning all nuclear weapons and existing nuclear programs and returning, at an early date, to the Treaty on the Non-Proliferation of Nuclear Weapons and to IAEA safeguards." The Joint Statement also committed the U.S. and other parties to certain actions as the D.P.R.K. denuclearized. The U.S. offered a security assurance, specifying that it had no nuclear weapons on R.O.K. territory and no intention to attack or invade the D.P.R.K. with nuclear or other weapons. Finally, the U.S. and D.P.R.K. were to take steps to normalize relations, subject to the D.P.R.K.�s implementing its denuclearization pledge and resolving other longstanding concerns. While the Joint Statement provides a vision of the end-point of the Six-Party process, much work remains ahead to implement the elements of the agreement. Despite the agreement of all parties, including the D.P.R.K., to return to the negotiating table in early 2006, the D.P.R.K., since November 2005, refused to return to the talks, citing U.S. action against its illicit banking activities. The U.S. remains prepared to resume the discussions without preconditions, and has called on the D.P.R.K. to do the same. Under President Roh Moo-hyun, the R.O.K. has simultaneously sought the elimination of the D.P.R.K.�s nuclear weapons through the Six Party Talks and pursued a policy of reconciliation known as the "Peace and Prosperity Policy." By engaging with the D.P.R.K. through projects such as the Kaesong Industrial Complex, the R.O.K. hopes to invigorate the North Korean economy and engineer a gradual, long-term unification process. Under the 1953 U.S.-R.O.K. Mutual Defense Treaty, the United States agreed to help the Republic of Korea defend itself against external aggression. Since that time in support of this commitment, the United States has maintained military personnel in Korea, including the Army�s Second Infantry Division and several Air Force tactical squadrons. To coordinate operations between these units and the over 680,000-strong Korean armed forces, a Combined Forces Command (CFC) was established in 1978. The head of the CFC also serves as Commander of the United Nations Command (UNC) and U.S. Forces Korea (USFK). The current commander is General Burwell Baxter "B.B." Bell. Several aspects of the security relationship are changing as the U.S. moves from a leading to a supporting role. In 2004, agreement was reached on the return of the Yongsan base in Seoul--as well as a number of other U.S. bases--to the R.O.K. and the eventual relocation of all U.S. forces to south of the Han River. In addition, the U.S. and R.O.K. agreed to move 12,500 of the 37,500 U.S. troops out of Korea by 2008. At the same time U.S. troops are being redeployed from Korea, the U.S. will bolster combined U.S./R.O.K. deterrent and defense capabilities by providing $11 billion in force enhancements in Korea and at regional facilities over the next four years. As Korea�s economy has developed, trade has become an increasingly important aspect of the U.S.-R.O.K. relationship. The U.S. seeks to improve access to Korea�s expanding market and increase investment opportunities for American business. The implementation of structural reforms contained in the IMF�s 1998 program for Korea improved access to the Korean market, although a range of serious sectoral and structural barriers still remain. Korean leaders appear determined to successfully manage the complex economic relationship with the United States and take a more active role in international economic fora as befits Korea�s status as a major trading nation. On February 2, 2006, the two governments announced their intent to negotiate a Free Trade Agreement (FTA). Together, there will be 5 rounds of talks; two in Korea and three in the U.S. Because the President�s Trade Promotion Authority (TPA) expires in June 2007, the U.S. is seeking to conclude FTA negotiations by the end of 2006. If successful, a comprehensive U.S.-R.O.K. FTA would bring greater vibrancy to this already close economic relationship, creating 100,000 new jobs and trade worth $20 billion through increased trade and investment. The U.S. Embassy in South Korea is located at 32 Sejong-no, Jongno-gu, Seoul 110-710. The contact information for the U.S. Embassy is: American Embassy-Seoul, Unit 15550, APO AP 96205-5550 (tel. : 82-2-397-4114; fax: 82-2-738-8845). The U.S. Agricultural Trade Office (ATO) is located at 146-1, Susong-dong, Jongno-gu, Leema Bldg., Rm. 303, Seoul 110-140 (fax: 82-2-720-7921). The U.S. Export Development Office/U.S. Trade Center can be reached c/o U.S. Embassy (fax: 82-2-739-1628). Library of Congress. North Korea: A Country Study. 1994. Library of Congress. South Korea: A Country Study. 1992. Department of State. The Record on Korean Unification 1943-1960. 1961. Department of the Army. Communist North Korea: A Bibliographic Survey. 1971. The following sites are provided to give an indication of Internet sites on Korea. The Department of State does not endorse unofficial publications, including Internet sites. Korea Society--http://www.koreasociety.org/; links to academic and other sites. Nautilus Institute--http://www.nautilus.org/; produced by the Nautilus Institute in Berkeley, California, and includes press roundup Monday through Friday. Korea Web Weekly--http://www.kimsoft.com/korea.htm; links to North Korean sites. Korea Herald--http://www.koreaherald.co.kr/; South Korean English-language newspaper. Korea Times--http://times.hankooki.com/; South Korean English-language newspaper.